This post is also live on my blog at Inks and Pens so check it out there please! Sailor, the Japanese manufacturer of pens and inks, recently discontinued their previous line of Jentle ink and replaced them with some new Jentle colors. 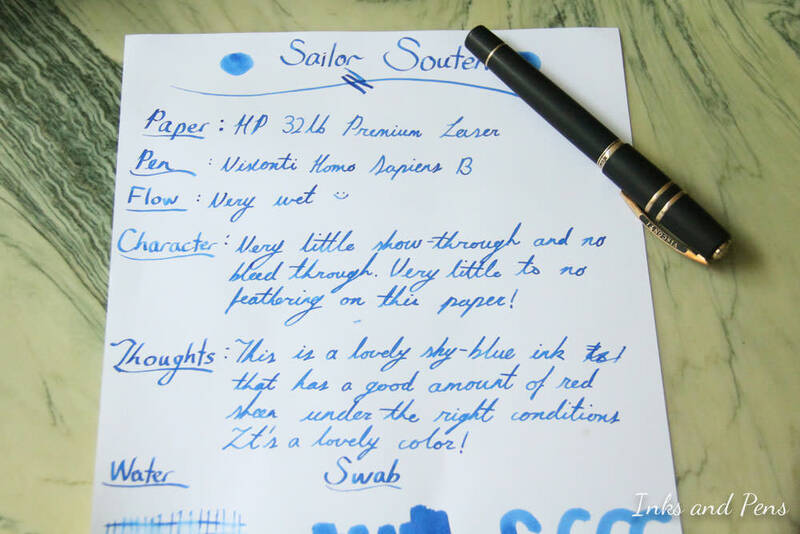 Sailor Souten, or Azure Sky, is very similar to the discontinued Sky High ink in terms of color and red sheen. 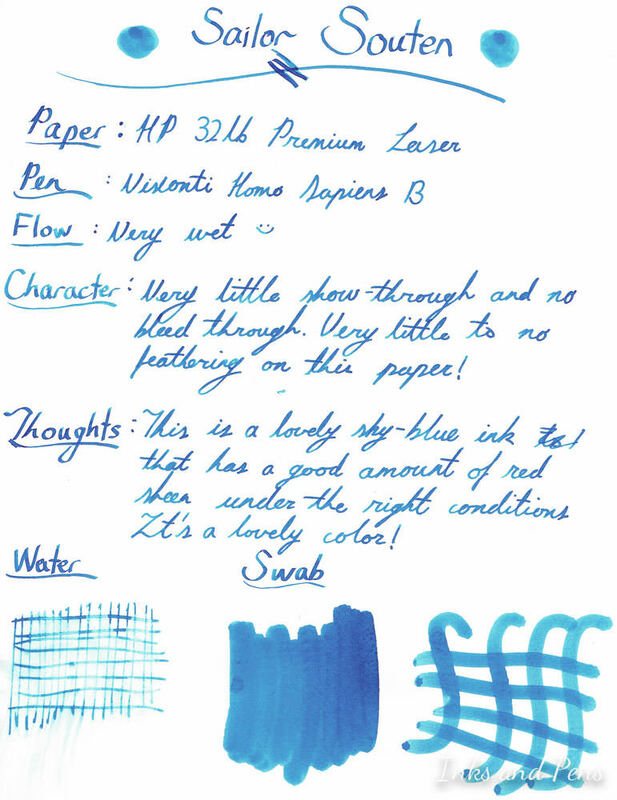 Souten is actually also quite close to Pilot Iroshizuku Kon-Peki although it is a tad bit darker. On paper, this ink behaves very nicely, with no feathering, show-through, or bleed-through. The ink is quite wet coming from my Visconti Homo Sapiens and nicely lubricates the nib. You can see some shading from a lighter blue to a darker blue, but not much. This is not one of those shading inks. The dry time is actually quite fast for a wet ink like this. On Tomoe River paper, this ink exhibits a crazy amount of red sheen, more than any other ink I've seen before. The sheen is also present on other high quality papers like Rhodia and Clairfontaine but in lesser amounts sadly. Here is a swab of the ink. You can see that there is a small amount of red sheen on the wetter swab on the left. So far I have had no issues with using this ink. There is no staining at all and it is very easy to clean out of the pen. 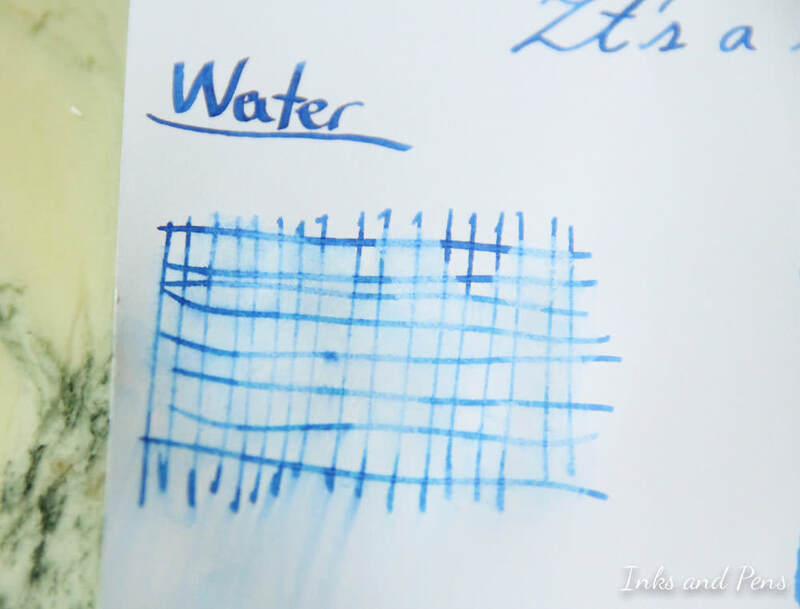 The water test for this ink shows that it is not very resistant to water, but small traces of the color can still be found. There was not too much smearing, so it didn't impede seeing the other dry grid lines. Water was dripped into the grid for about 15 seconds then wiped off with a tissue. Personally, I find this to be a very well-rounded and solid blue with nothing to complain about. 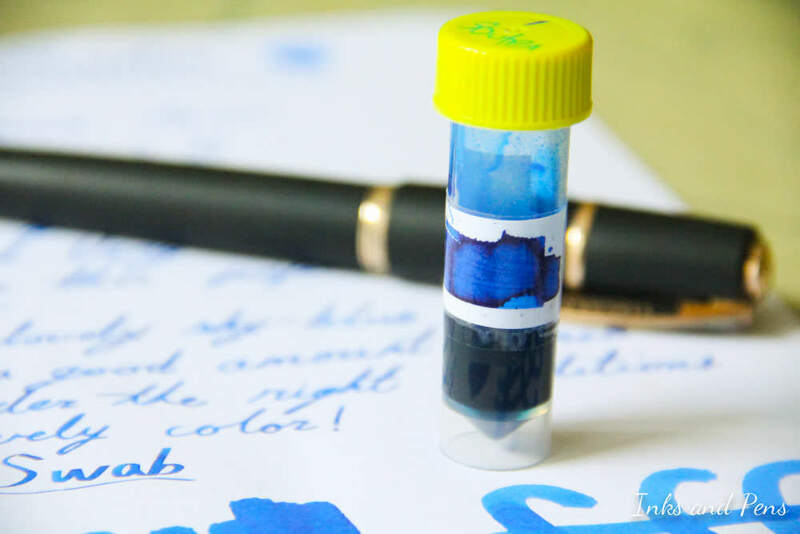 The huge amount of sheen does set it apart from other blues within the same range. The color is dark enough to be professional but still interesting enough for letter writing and journalling. Very nice review. This is one of my favorite blues...looks like I have to try it with TR paper. I actually prefer Sky High, but as you say, this is a fairly close match. For me, Souten sheens in dark pink, with silver edges on the very wet patches, rather than the red you describe. The silver fades as it dries, but stays where the ink pooled heavily. I get the sheen on Midori MD, Caledonian Smooth, onion skin and >65gsm tracing paper too. I find Kon-peki boring but I love Souten. Thank you for this review. It is a very nice blue. Edited by Algester, 23 July 2015 - 16:05. Really? I even tried it with one of my convertors, but I haven't had an issue! 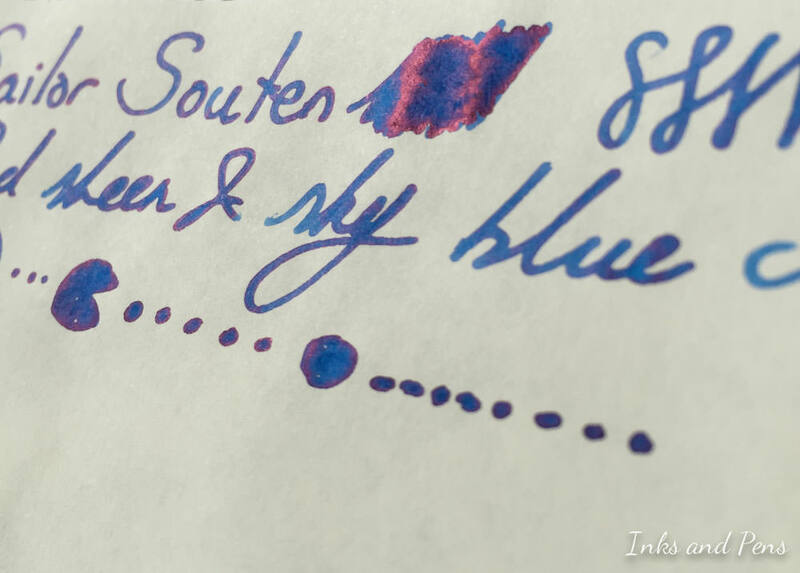 I concur, Souten does stain, but, in my experience, no where near as much as other inks. A "laxative" ink would be enough remove Souten's staining in a fountain pen converter. I am glad you said that, I feel the same way and everyone else loves Kon Peki. You made me feel like less of an iconoclast. I have tried Kon Peki at least 3 times and just can't warm up to it. Hmmm I'll have to try again soon! I'll report back! I have yet to add a cerulean blue to my collection. I value behavior over flair. At this point, I am leaning Kon Peki/ Edle Topaz. Thanks for this review. I bought some this summer and really enjoy it. I'm a big fan of EF/XF nibs and, while Souten is nice in the finest nibs (e.g. TWSBI EF), it doesn't tap into all of the ink's properties. Even by going up a nib size (Parker 45 F), a lot more shading and sheen shows up, which really shows off the ink nicely. 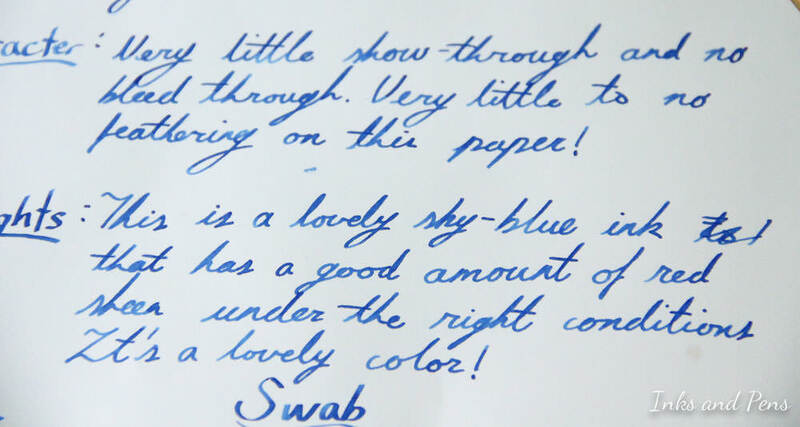 The ink's color is variable in a very cool way. Edited by goodpens, 05 September 2017 - 19:40. Souten is a gold standard blue. I think it's actually a little more medium-leaning on dry flowing. One of the heaviest sheeners around, like many sailor inks. 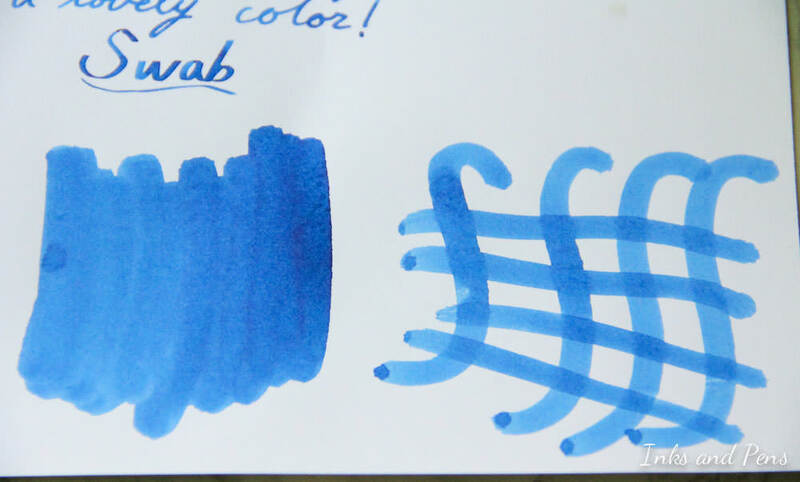 If you want a really truly wet flowing blue with heavy red sheen, I think Diamine Blue Velvet is much wetter.